Knowledge of the atmosphere and the forces acting within it to create weather is essential to understand how weather affects a flight. By understanding basic weather theories, a pilot can make sound decisions during flight planning after receiving weather briefings. For additional information on the topics discussed in this category, see the following publications as amended: AC 00-6, Aviation Weather For Pilots and Flight Operations Personnel; AC 00‑24C, Thunderstorms; AC 00-45, Aviation Weather Services; AC 91-74, Pilot Guide: Flight in Icing Conditions; and chapter 7, section 2 of the Aeronautical Information Manual (AIM). Weather Flying by Robert N. Buck – Regarded as the bible of weather flying, this aviation classic not only continues to make complex weather concepts understandable for even the least experienced of flyers, but has now been updated to cover new advances in technology. 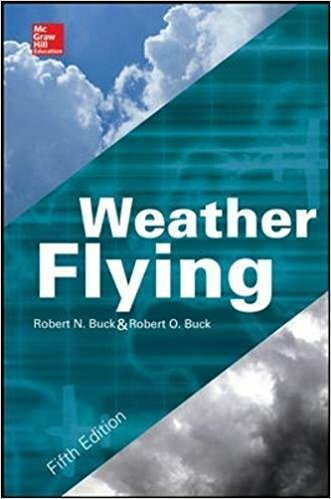 At the same time, this respected text still retains many of its original insights from over four decades of publication, provided by renowned weather flying veteran Robert N. Buck. In a straightforward style, new author Robert O. Buck (son of the book’s original author) delves into how computers, personal electronic devices, electronic flight instrument systems, and other technologies are changing the way general aviation pilots fly weather. He addresses the philosophy and discipline required to use these systems, what they are really telling us, and their task as supplement to good flying sense. The updated Fifth Edition also discusses how to handle changes in FSS weather briefing, including a look at new weather information products and airborne datalink weather information as they affect weather flying.